With mere hours to go on the Turkey Day countdown, you’ve probably checked most items off your official Food Network Thanksgiving Planning To-Do List. According to the Food Network guide, my menu should have been planned one month in advance. That’s ridiculous – mine has been planned for much, much longer – almost a year to be exact. I’m not all that organized, it’s just that my bill of fare revolves around that Holy Trinity of Thanksgiving – turkey, dressing and taters. The planning guide says to make my guest list early. When did Thanksgiving ever have anything to do with guests? They’re called relatives. Thanksgiving, as mandated by federal law, specifically requires you to spend your day off engaging in awkward family encounters. Which is, of course, why the gin and tonic was invented. At the two-week mark, Food Network says I should choose my décor. I could create a neutral, earth-toned place setting, a lovely fall floral arrangement, or design a minimalist, less-is-more holiday table. Because everything about the Thanksgiving holiday screams minimalism. But I decided to go with something that felt more natural, with a hint of autumn whimsy – my Halloween cobwebs. It’s the easiest decorating job ever. I leave them up year-round. Food Network suggests I create my seating plan before the Big Day. But that’s one detail best left until the very last minute. Because the seating arrangements must always take into consideration how many gin and tonics have been consumed, and by whom, prior to actually gathering round the table. Some families require seating charts that are put together with the precision and diplomacy of nuclear disarmament talks. Because putting your ACLU card-carrying nephew next to Tea Partying, Sarah Palin lovin’ Grandpa is a recipe for a holiday disaster that would send Norman Rockwell screaming from the room. Also at the one-week mark, Food Network says I should plan for leftovers. Double duh. Part of the planning is making sure you HAVE leftovers. Even without the benefit of their website, I can plan for any food related event far in advance. Because I tune in to the Food Network every time I get on the treadmill. While Food Network insists I make many plans, I’ve discovered a few things that the folks at this fine channel would never approve for a Turkey Day spread. I present Exhibit A – Turducken. The name alone elicits a gag reflex. 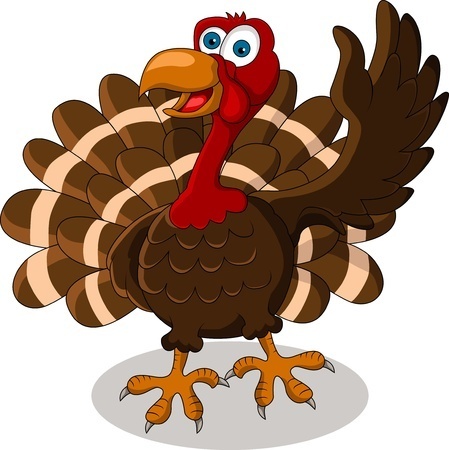 Turducken is an example of engastration – where a deboned chicken is stuffed inside a duck which is stuffed inside a turkey which will be stuffed inside your own personal gut. And if you thought it couldn’t get any worse, I present Exhibit B – Turbaconducken – engastration lattice wrapped in bacon. Somewhere in Connecticut, Martha Stewart just threw up. If your guest list includes Ozzy Osbourne and his entourage, you might want to consider the Supersized engastration – the True Love Roast. This is the Big Daddy of them all, a turkey stuffed with a dozen different fowl including a pigeon. It has 50,000 calories, takes 8 hours to cook and can feed 125 guests. But Ozzy gets dibs on the pigeon. The final Thanksgiving Oh-No You Didn’t is a recipe for a special Turkey Day Cake. Ground turkey meat is cooked in cake pans, frosted with mashed potatoes and garnished with cranberries. This simple, yet imaginative, dish will cut your guest list down significantly. Odds are, you’ll be eating it alone. Makes me wish I could sit down to Grandma’s 100% Nothing Natural Thanksgiving in a box from Winn Dixie complete with her trademark still quivering cranberries in the shape of the can. And a couple gin and tonics.